I had big plans to spend the afternoon laying out and hanging around with my Jeremy's cousin! I was excited! I need some sun! No Florida person should be this pale! The weather had other plans. It hasn't rained...no that would be to easy. Instead it just turned dark and looks like it could at any minute....even though it has been hours and still hasn't released a drop. I am trying to resist the urge to put on a movie, grab a bowl of ice cream, curl up under a blanket and stay that way till my love gets home tonight. On the upside of it not raining I was able to put the pups outside where they have spent the afternoon with out coming to the door and beating it down. That has given me time to try and expand my blog audience and my who I follow. I have neglected this lately but I am trying to get back on top. 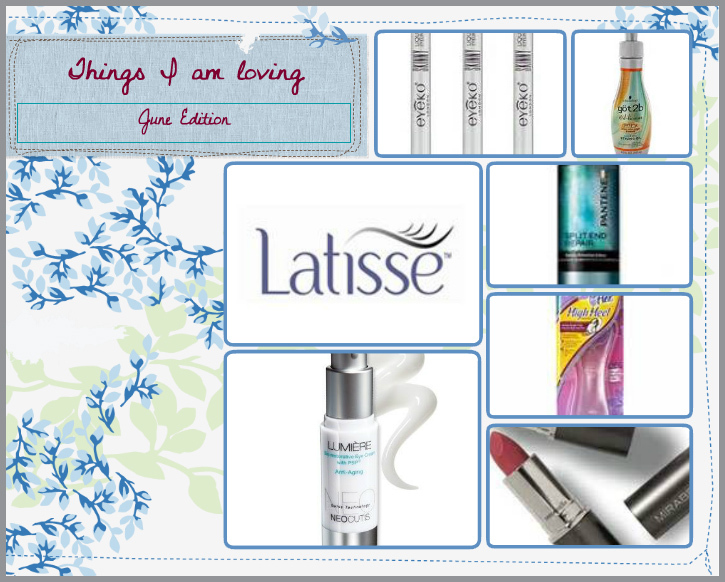 So on with the blog and today it is Things I am loving!!! First up: Eyeko skinny liner. I have a review of this on the blog. I love it! I haven't touched my other liners since I received it!!! I swear by gel liner but this could be the one liquid that changes my mind!!! Got2be Oil-licious! I bought this at a sale walgreens was having ( I am a sucker for an orange tag at walgreens!!) Put it on my shelf and there it set....until I an out of the $30 oil I had been using. I use it with the Pantene split end mender. I mix a bit of the two together in my hand run it through my hair starting at the ends and bam! My hair is just as amazing as it is when I use the other stuff!! Dr Scholls for her high heels - I love my heels but they don't love me. I put a pair of these in my favorite, and also least comfortable, heels and my feet felt so much better. Especially on the ball of my foot!!! These are a must for high heel lovers!! They didn't move they didn't make my feet sweat! I loved them. Latisse - Longer thicker lashes using a product that takes on a minute to apply?? Yes please! I had used it for a few weeks and got out of the habit when I went back to Tennessee for a week. I was afraid to travel with the precious stuff. It isn't cheap but it works! Mirabella Sheer lip stick - I have never been a lipstick girl. I just can't get into it. The heavy color, the thickness of it, the heaviness. Just give me my lip gloss and I will be fine. This has changed my mind! The color isn't thick, it isn't heavy. It just gives your lips a touch of color with a beautiful gloss. I wear this everyday now!! Neocutis Lumiere - Voted best eye cream for the the fifth year in a row? How could I not try it. Plus my Rep for Neo is the cutest and best ever!!! I started using this on my right eye against another brands serum.....hands down Lumiere was the best. I asked Lauren if Neo made anything for lips because mine were staying chapped and cracked already this year and she suggested I try the lumiere. I haven't had a problem since. I am a huge Neocutis fan. I have also written a review on their biocream here on the blog. I would love to try their bio-serum next. I am always looking for new products to try and review let me know what you are loving!